Considering a visit to Sonoma’s Russian River Valley wineries? 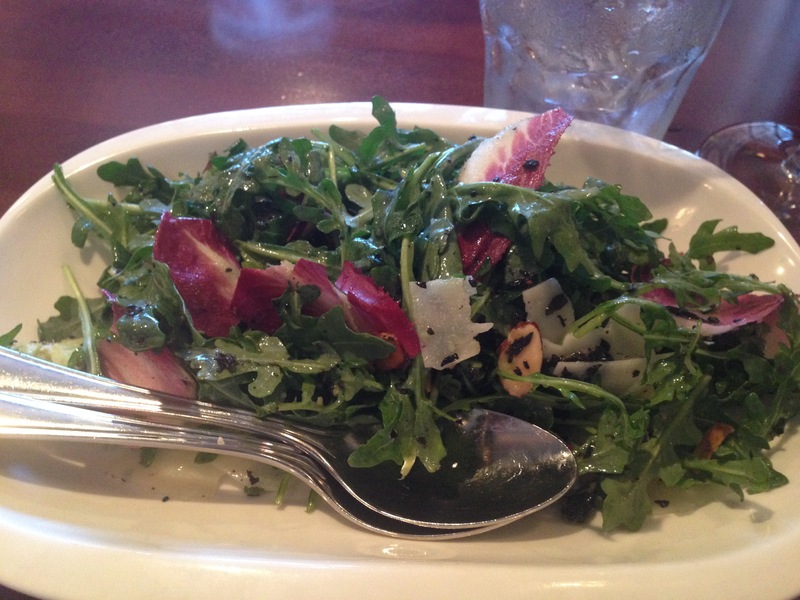 Make sure to stop into Willi’s Wine Bar for pretentious food -without the pretentious ambiance or price. Willi’s Wine Bar of Santa Rosa, California, embodies every quality that makes Sonoma County an attractive wine destination. It appears more laid back and relaxed, less pretentious and showy as compared to its sister Napa, but its wine and food is in lock-step. Calling Sonoma the Anna to Napa’s Elsa is a bit of a stretch (does that make the Central Coast Olaf the snowman, then?) – but might not terribly far off. I am a huge fan of scenic and elegant Napa County, but its hoardes of tipsy tourists, splashy tasting rooms, and excessive prices have led me to appreciate the (relative) slower pace in Sonoma. The towns of Sonoma and Healdsburg, the latter of which is a bit more polished and resembles more the Napa towns of Yountville and Calistoga, have great dining options and tasting rooms in their own right. But for those visiting the famed Russian River Valley, great meals require a bit more of a search (and drive). On a recent day trip to the Russian River Valley, my group received an enthusiastic recommendation from a winery staffer for Willi’s. She declared it the best food in Sonoma County – no small honor. While Sonoma’s restaurant scene lacks the heavy investment and celebrity chefs of Napa County’s, its reputation for great wines and proximity to San Francisco ensures its chefs are held to high standards. Our group had no choice but to try it. A short, five minute drive south of the River Road wineries in Windsor, Willi’s Wine Bar is an unassuming roadside stop. If you weren’t looking, you might confuse it for a converted gas station or general store. Inside, its atmosphere is California countryside meets French country brasserie. Its menu is an impressive array of international small plates. In other words, it is a great place for a small group willing to share (or hoard and sample!). Choosing just two plates for lunch was difficult. It was a warm, sunny day and I wanted a lighter meal, so I chose ahi tuna tartare (pictured in the featured photo) and an arugula salad. Both were decent portions for having been labeled as small plates. Both were perfect; I had not a single complaint or suggestion for balance of flavor or texture. And despite having sandwiched lunch between two wine tastings, I had to check out Willi’s wine list – it has “wine bar” in the name, after all! The extensive wine list highlights not just California wines from Sonoma and beyond but international imports as well. Restraining myself, I had 2 oz. “taste” of French rosé. Two of my friends selected the pork belly potstickers with shiitake mushrooms, which were light and subtly flavored, they told me. When both sampled another friend’s crispy pork riblets, however, they expressed instant jealousy and regret they hadn’t chosen the succulent, intensely seasoned ribs. 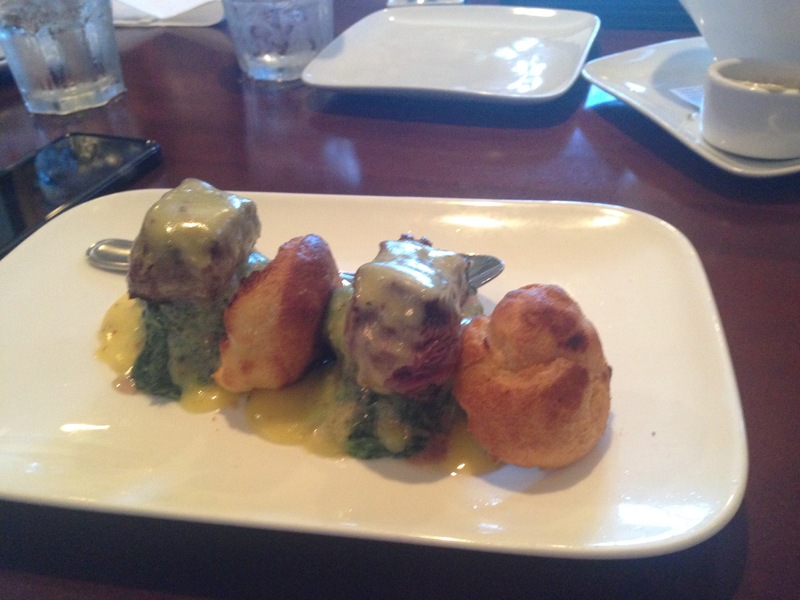 The last member of our party chose filet mignon sliders with creamed spinach and bernaise – of which I was envious. The sliders were the first menu item that caught my eye, in fact. He loved the sliders so much that he ordered a second round of them – all for himself. He was kind enough to allow me to try it, and I will say the sliders were definitely a great bite. 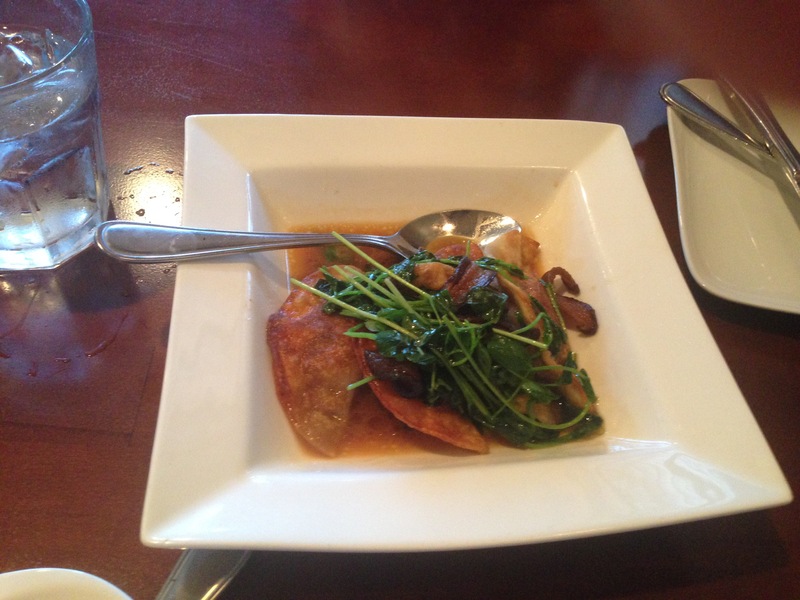 We left Willi’s fortified for our next wine adventure and with a list of other dishes to try on our next visit. I have no doubt that next visit will happen soon.